Leverage. Whether buying a car, moving a piano or tactical hog hunting, leverage gives us an edge. I think 2014 is the year of the thermal optic leverage, and while we’ll be looking at multiple thermal scopes this year, the one to beat is the ATN THoR. Now, that might be news to some who remember ATN as a vendor of sub par foreign night vision (NV) a few years ago. With a management change came a new set of priorities, and a new US made flagship product – the THoR thermal weapon sight built by ATN using the latest thermal core technology. I’ve spent six months using a ThOR 336 3x-12x. It’s not perfect, but it is very good; good enough in fact to be a game changing point of leverage for the nocturnal hog and predator hunter. My first forays into night hunting hogs with my buddy Jared were as high tech as an AR-15 and a spotlight. Safe to say, we never killed a pig that way. I don’t think we ever even saw a wild hog while spotlighting. A few rabbits may have paid for our frustration with their lives. Hogs are smart, and lights after dark typically tip them off as to what’s up. Night vision, which intensifies available light, can work really well when it comes to shooting hogs at night. But in my experience, nothing beats thermal when it comes to spotting hogs. And nothing beats thermal when it comes to filming first person shooter perspective of dropping hogs. I’ve kept the ATN THoR mounted to my Israeli Weapon Industries Tavor since November. It’s a really great package giving my .223/5.56 caliber rounds the full velocity of a sixteen in barrel while in a package the size of an SBR (short barreled rifle). It also nicely holds my micro DVR from Ultimate Night Vision velcroed to the side. You might say it’s a full featured lever the hogs aren’t prepared for. To give you an idea of what hunting with this kit is like, I returned to the Spike Box Ranch outside Benjamin, Texas. The staff and hunting there have consistently been top notch, and the hogs more cooperative in playing their tragic roles for the short filming process than pigs in some other places. After some ribeye’s compliments of Hunting Manager Anthony Ainsworth, we headed out to a wheat field with Ranch Manager Mark Baugh. I never cease to be amazed at what damage hogs can do. Sure enough, there they were, up to no good, and glowing white on the ThoR’s screen from their body heat in the cool night air. The group of about a dozen feral pigs had formed a line running east to west and moving south as they enjoyed dinner. It wasn’t a leisurely movement south. We didn’t run to catch them, but we did have to hustle southward ourselves for a couple hundred yards or so. Even then, it was 75-100 yards when I first squeezed the trigger. I’ve been told more than a couple of times that .223 is just too little a bullet to hunt hogs. That may be true depending on the hogs and the bullets. But in hunting the typical Spike Box 100-220 pound hogs, DRT Ammo’s 55 grain bullets have done well for me. That first shot found its way home to a pig on the east side of the group, and as you’ll see in the video, it just falls over, leaving me the chance to go after more. I didn’t edit out the misses that followed. The third or fourth shot connected well enough to take down another hog. One of the challenges with thermal is that depending on the variables of lens, magnification, resolution and refresh rate, you don’t get a lot of details through the scope. In this case, I was essentially shooting at silhouettes, and when the silhouettes overlap, they are hard to judge. One hog could be ten feet behind the other, but you can’t tell. I followed the remainder of the group through the THoR as they exited the field. I wanted to get some more shots on them, but there was another glowing object behind them. Was it a distant group of more pigs? Something mechanical? Or perhaps a rock face that still retained heat? Don’t know = Don’t shoot, so that was the end of that. So, yes, thermal has its limitations. As ambient temperatures approach body temperatures, animals are harder to distinguish. Unlike night vision (NV), thermal devices cannot see through your windows, as your glass has its own consistent temperature blocking the thermal view outside. But after your hunt you can head home and check your house for leaks of heating or air conditioning using the thermal imaging from the THoR. You can’t do that with night vision! Like other technologies, thermal has gotten better and cheaper over the past several years. ATN THoR thermal weapon scopes have varying specifications including lens choices, refresh rates and resolution. Prices online range from $3500 to $10,000, with a three year warranty on the scope and a ten year warranty on the sensor. I like leverage, at least when it’s working for me, not against me. After six months of killing wild hogs using the THoR, I’m happy to report that it is indeed a great lever, and one that is more affordable as I write this then when SHWAT™ got ours. 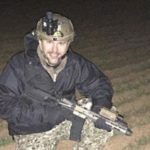 Here’s the best part of using thermal – you can be out experiencing the thrill of tactical hunting, making great memories, instead of sitting home thinking about it! Watch SHWAT.com for more thermal in the second half of 2014. 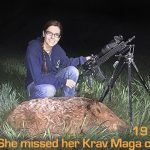 This entry was posted in Special Hunting Weapons & Tactics™ - The Center of Gravity for Tactical and Long Range Hunting and tagged 9mm, ATN, Hog Hunting, Night Vision, Tactical Hog Hunting, thermal by Jonathan Owen. Bookmark the permalink.